Click entry form (above) to log in with your email address to enter. We need your email address to notify you if you win (we do not store your email address). You may choose to log in with Facebook if you prefer. After you login to enter be sure to write a comment on this blog post (below) to complete your entry. Where do you do that? Scroll down this page to the comments section to add your comment. The three (3) random winners will receive an email on December 16th, 2015. Only one prize per person and per household will be awarded. You must purchase flowers from our Christmas Flowers or Christmas Centerpieces web pages to be delivered to a USA address before Christmas Day – December 25th, 2015. You can order flowers for yourself or someone else. Your centerpiece will be hand-delivered by a local USA florist. Cannot be combined with any other promotional offer or coupon. If you want to order extra arrangements for yourself or holiday hostess please use CHILLY10 for $10 off Teleflora sitewide or FROSTY20 for 20% off Teleflora.com. Be sure to place your order ASAP for your Christmas flowers, our bestselling keepsakes sell out quickly! Don’t forget to comment below to be eligible! ​SWEEPS! Enter to Win a Christmas Centerpiece! The Thomas Kinkaid Country Christmas Homecoming is really nice. I would love to win the Mercury Glass Bowl Bouquet. I love the Teleflora’s Mercury Glass Bowl Bouquet. I would LOVE to see the Christmas Blush Bouquet on my table for Christmas! I love the Snoopy’s Cookie Jar by Teleflora! I think my grandma would love this. I love them ALL but the Thomas Kinkade is very nice. I like the golly/jolly candy cane arrangement although Snoopy’s dog house is a very close second. snoopy! so my kids enjoy too! They are all so pretty! Would love to win something classy for Christmas! Now that is a hard choice! But my favorite is By Golly, It’s Jolly!!! You wouldn’t believe how much I love flowers! My desk used to look like the scene from Fried Green Tomatoes. I ordered Teleflora for my parents Christmas gift and would like some for myself too! They’re all so stunning – would love any in my home. I’ve always loved the looked of floral centerpieces with candles – Holiday Glow Centerpiece would be perfect on my dining table. I love them all but the Thomas Kinkade’s Country Christmas Homecoming is so beautiful! The Snoopy Cookie Jar Bouquet. I’m a big Peanuts fan. The Candy Cane Christmas would be a beautiful centerpiece my whole family would love!!! Beautiful! Happy holidays! Merry and Bright looks like it would live up to it’s name on my Christmas table! I have been blessed by receiving a kidney from a living donor on 12/18/15 would love to win flowers to give to her. I don’t care what it is. They’re all pretty! I would like to win to give to my Mom. She loves Christmas arrangements. Teleflora’s Mercury Glass Bowl Bouquet is so beautiful and reminds me of Christmas past with a modern twist. I would love to win the Beautiful in Blue Bouquet. Wow! My table could really use a bit of sprucing up with a Merry and Bright centerpiece! I would love Snoopy’s Cookie Jar. Peanuts is special in this family. The Kinkaid arrangements are so special. The Deck The Halls Tree would look so beautiful & festive at our family Christmas dinner. PEANUTS® Christmas Mug is so adorable!! Teleforas Merry and Bright. I love them all! I like their Holiday Magic. I would like to win Holiday Homecoming Basket. Winter Grace Bouquet, but they’re all beautiful! The Let It Snow would look great with my Christmas decorations. http://www.teleflora.com/flower-arrangement/snoopys-cookie-jar-by-teleflora/p_t15x300a I love the peanuts gang theme! So unique and makes me smile because it reminds me of my childhood. Ty for chance ! I would love the Teleflora Snoopy’s Cookie Jar! My daughter would love it too! Teleflora’s Merry & Bright would be my pick. I would love to have the Thomas Kinkade’s Country Christmas Homecoming Flower Arrangement! It’s so very beautiful. I would be very excited to see any of these centerpieces on my table at Christmas, but I am quite fond of The Christmas Blush Bouquet. I just love them all but if I have to choose one I would start with the Thomas Kinkade’s Country Christmas Homecoming. “Deck The Halls Tree” is jaw dropping and stunning and would make an elegant centerpiece!! Such lovely choices you have!!! I would love to win the Let it Snow Floral arrangement it is lovely! This would be a great gift for our Christmas table! Would love to get Christmas flowers for my wife and son’s Christmas birthday! I really like the Thomas Kinkade’s Country Christmas Homecoming! It would be lovely at my in-laws’ house! I’d love to win the Snoopy’s Cookie Jar. Oh my goodness, I never knew you created so many beautiful centerpieces. All of them are lovely and I would enjoy them all but if I had to choose 3 I suppose I would choose. . . The deck the halls tree, Holiday homecoming basket, and Holiday splender. 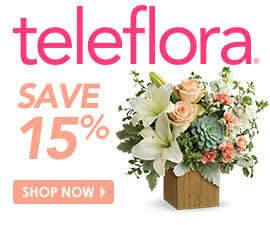 I’d like to win your lovely “Teleflora’s Silver And Joy Centerpiece”. Thanks and God bless!